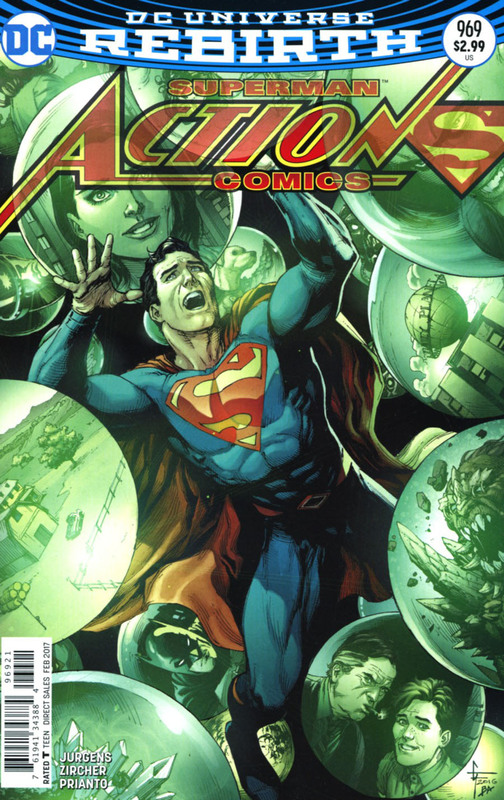 Superman floats above Metropolis and trie to locate Lex as Lois and the other Clark argue about why Luthor was taken. Meanwhile in a distant galaxy Lex argues with his captors about the validty of his capture. We learn that L'Call has been killing men that were shown to be future threats for some time but Lex is the first one he brought back to his world. We also find out that L'Call has grown weary of his mission but was convinced to go out once again to get Lex. Back on Earth Superman visits the Geneticron building and finds a portal that will hopefully take him to save Lex. Story - 5: I really enjoyed this issue. Over the past few reviews I've mentioned that L'Call and Zade had a definite nineties vibe about them which suggests that there wasn't much to them as characters. 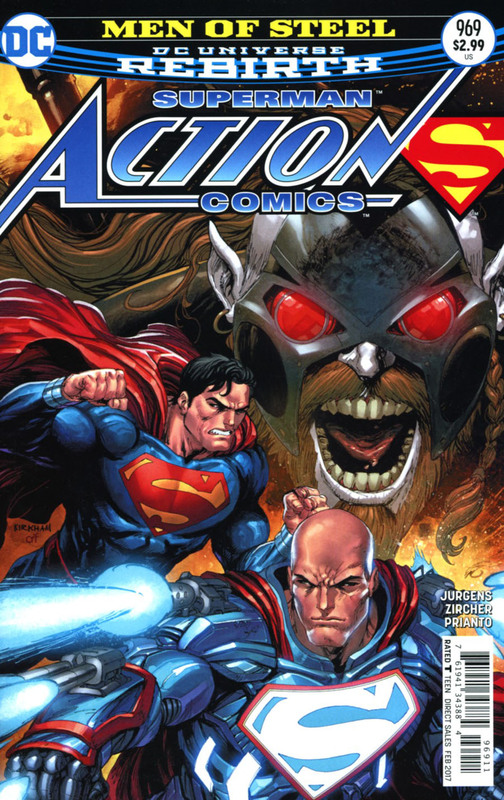 To be fair they were the loud, angry antagonists that spent most of their time fighting Lex or Superman but all of that was set to the side for this issue and Jurgens delivered a character driven piece that shed some light on who these characters really are. Some of L'Call's motivation and backstory could be a tad on the clich�d side but it never comes off like that in the writing. I genuinely felt for the guy and by showing us that he has his own doubts about his vocation and why he's doing what he's doing Jurgens elevated him from loud, shouty guy to someone who has a personality and a past. You could argue that that the villain serving another villain that is even worse than the first villain is another clich� but I think Jurgens makes it work here. Lex is fantastic throughout the issue. Not only is he arrogant but he also provides the counterpoint to what L'Call and Zade are doing. It's an interesting moral dilemma that reminds me of the "Do you go back in time and kill Hitler as a baby?" style question. I also dug the SUPERMAN: THE MOVIE reference Jurgens dropped in towards the end. I almost wish he would have completed the line by having Lex say that nobody's perfect...well, almost nobody. There are other small moments that I liked as well. Jonathan being frustrated that he can't help his Dad likes he want to was one of those moments. Another was Lois and Not Clark arguing over whether it's right to kill Lex before he becomes a galactic dictator. Having these character driven moments in the middle of the story makes for a meatier read and serves to give us a breather from all of the fighting. Jurgens continues to bring his A game to this series and because of that I continue to be glad that this is a bi-weekly book. Art - 5: Patrick Zircher continues to produce some outstanding art for this series. The storytelling is strong on every page and I liked much the artwork brought the alien world the story is mostly set in alive. The expressions and body language that he gave L'Call went a long way to making that character sympathetic and I loved the shot of L'Call sitting cross legged as his memories literally bubbled up around him. I was also fond of the design element of having dramatic shots of Superman open and close the issue. Cover Art - 4: This is a dynamic cover. Superman's face looks a little off but both he and Lex have an action vibe to them. L'Call is screaming in the background which makes for an interesting design element. Variant Cover Art - 4: This cover reminds me of Gary Frank's previous ACTION COMICS work, specifically the BRAINIAC storyline. I'm not quite sure what to make of the design but the composition is sharp and I like the green hue.